The Eye was at HART's Legislative Committee meeting Monday where the proposed Memorandum Of Understanding (MOU) agreement between HART and PSTA was discussed. Important to note: this MOU is a legally binding agreement just like any other inter-local agreement. Pinellas County Commissioner Janet Long, a Democrat who is also Vice-Chair of PSTA, has been using PSTA as a proxy to push her regionalism proposal that includes merging PSTA and HART, regionalizing decision making and power and pursuing a multi-county sales tax hike [2020?]. As we find out what is going on in those "quiet discussions" held underneath the radar of the public, there are valid concerns about the true intent (at least by some) of this MOU agreement. 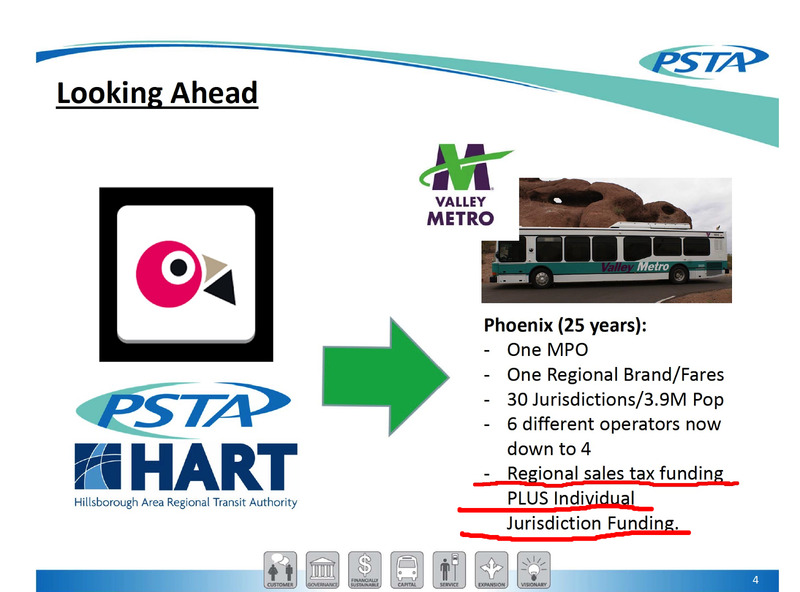 For transparency, I made a public comment at the beginning of the HART Legislative meeting expressing concerns about the MOU and requested assurances that this agreement not be used to pursue a merger with PSTA. The Board members discussed the MOU. There were a few fireworks and some tap dancing going on as statements were made that the MOU is an endeavor to work together and collaborate and not a merger. SaintPetersblog reported on the meeting: HART board members deny that collaboration with PSTA is a backdoor attempt to merge agencies. They reported what HART Attorney David Smith said after citizens voiced concerns during public comment. “Anyone who tries to interpret this as a pre-merger or merger, is, I don’t want to say hallucinating, but there’s no basis in fact for that,” said HART attorney David Smith, when asked if it was necessary to include Calvert’s “no merger” request in the MOU itself. Ironically it was HART Board attorney David Smith who recommended some changes for clarification and we assume he was not hallucinating. Another change added to the MOU is that the agreement must be reviewed and re-authorized annually and a document on all actions taken must be annually provided. That is good as it adds needed accountability. “None of these words in this document speak to any type of merger, taxation. Nothing about going to Tallahassee. Nothing,” said an exasperated Sandy Murman, chairman of the committee. Board member Mike Suarez also said he didn’t see anything in the draft agreement that touches on merging. Perhaps the HART Board members should watch the videos of PSTA's January 4th Legislative Committee Meeting where Long stated the timeline is more important than the MOU; and PSTA's January 6th Executive Committee Meeting where Miller outlined the aggressive timeline to get the agreement approved and immediately take it to Tallahassee to ask for state money to fund Long's regionalism agenda; and read Commissioner Long's Presentation she gave at PSTA's January 13 Workshop meeting that clearly states her direction is for a merger and regional sales tax funding. The PSTA videos confirms Miller and HART's Eagan were working together on the agreement. It is not "hallucinating" but healthy skepticism to have concerns about the intent of this MOU legally binding agreement. While Long, Miller and the PSTA Board are clearly moving in the direction of a merger, HART Board members indicated otherwise at their January 23rd Legislative Committee meeting. Several HART Board members stated HART's sovereignty cannot be compromised. Boxold's departure also clouds an effort pushed by Pinellas County Commission chair Janet Long to create a regional structure for coordinating and implementing mass transit, which could include merging bus systems and transportation planning. That effort is gaining support and could require legislation this spring to study it. Long's effort is not gaining support and there is no evidence of such. Making such statement is fake news trying to create a false narrative for support that does not exist. Most people in the Tampa Bay area do not know about Long's proposal or have any clue about what she and her cohorts are attempting to do. Obviously, the Times missed HART's Legislative Committee meeting Monday discussing the MOU agreement, or someone did not hand them correct talking points, because there was no support by HART Board members for a merger or a regional sales tax hike. HART, PSTA, Long and the Times have created confusion. That happens when trying to ram through a confusing agreement on a fast timeline. The only way to resolve the mess is for specific language be included in the legally binding MOU that protects the taxpayers. The MOU agreement, passed at yesterday's PSTA Board meeting, will be on the agenda of the full HART Board meeting on February 6th. Collaborating where it is mutually beneficial makes sense and HART and PSTA already are collaborating. The best approach that would eliminate confusion or skepticism would be to address each area of potential collaboration separately so all the details of each collaboration is transparently discussed and provided in full disclosure. This MOU is a legally binding agreement just like any Inter-local agreement and there should be no confusion or gray matter swirling around it. We all know how lawyer legalese works if things are not specifically made clear in writing. Therefore, if the HART Board wants this type of agreement approved, we call on them to add language to the MOU agreement that specifically states "the intent of this MOU is not to pursue a merger or pursue a sales tax hike." 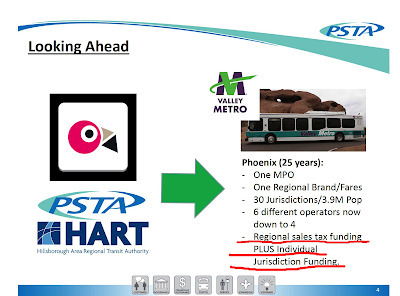 Making it specifically clear to anyone and everyone that the MOU agreement between HART and PSTA is not being used to pursue a merger or a sales tax hike is not unreasonable. It is the right thing to do that builds trust not skepticism. Otherwise Commissioner Long and her cohorts will be coming to Hillsborough County again to sell their regionalism agenda. The sovereignty of HART [and PSTA] must be protected to maintain their credibility. Most importantly, the local taxpayers must be protected.